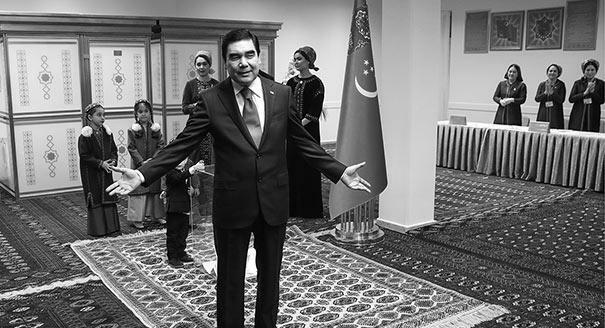 Even those who have no interest in Central Asia cannot have missed the recent amusing videos of Turkmen President Gurbanguly Berdimuhamedov on social media. In clips that have all but gone viral, the president leads workouts with his ministers, races cars, sings songs, and writes poetry. Especially popular are his meetings with military personnel, where Berdimuhamedov dresses up as heroes from American action movies and demonstrates the art of shooting while his subordinates jot down each of their president’s moves in their notebooks. Source: hronikatm.comThese videos began appearing online in 2013 and still come out of Turkmenistan regularly. They are made popular both by pro-government propagandists on the one hand, and by the opposition newspaper Chronicles of Turkmenistan, which enjoys trolling the Turkmen authorities. The comedy is spoiled only by the realization that videos of Berdimuhamedov are a sign of a deep crisis in the country. The videos are an attempt to somehow compensate for the frustration accumulating in Turkmen society. Instead of the “second Kuwait” promised by the authorities, Turkmenistan has been turning into a second Venezuela. The country was gripped by a severe food crisis in the winter of 2016–17. Even cigarettes, sugar, butter, and eggs became scarce. The authorities have imposed restrictions on the purchase of foreign currency. Despite the fact that global energy prices have partially rebounded, there are no immediate prospects that Turkmenistan will return to its former relative prosperity. After Ashgabat destroyed its relationship with Russia’s Gazprom in 2008, only China remained as the major client for Turkmen gas—but a significant portion of these revenues are used to repay Chinese loans. Having spent a lot of money on lavish festivals and palaces, the authorities now try to compensate for the decline in resource revenues with new taxes on medium and small business owners. Source: Youtube.com/Chronicles of TurkmenistanIn 2007, following the death of his predecessor, Turkmenistan’s first post-Soviet president Saparmurat Niyazov, a constrained and insecure Berdimuhamedov gave a modest speech at Columbia University in New York, assuring the audience that he was still young and would act as a reformer—though warning it would take a long time to solve all the problems that had accumulated in his country. However, he has used the time since not for reform but for luxury and propaganda. Until 2006, there was a de facto ban on the internet, and access to social media such as Facebook, Twitter, and VKontakte is still blocked. In 2013, the Turkmen authorities managed to even block access to the Kremlin’s official website because those who hold both Russian and Turkmen citizenship were writing too many complaints on it. Television in Turkmenistan is also under total government control. There are currently seven state TV channels in the country. News channels do not broadcast live, with the exception of grand holidays. Almost all news broadcasts contribute to the president’s personality cult. Criticism is allowed to appear in the media only after the president himself has issued criticism of some government agency or official. Television propaganda used to show visits by distinguished foreign guests, investors, and negotiations with international energy companies. But now nothing of the sort happens. The only positive content is the presidential entertainment. Since 2008, the Turkmen authorities have been trying to suppress the mass acquisition of satellite dishes in major cities by citizens who evidently do not enjoy watching this propaganda material. They are doing so not just to protect people from “foreign propaganda” but also to satisfy Berdimuhamedov’s aesthetic cravings. He has decided that all central streets should be covered in monolithic white marble and nothing should spoil these blessed cityscapes. For a long time, the authorities even interrogated people walking in city parks in the daytime, asking them why they were not at work. Since this summer, the fight against satellite dishes has extended into the countryside. Officials have been giving lectures in schools, kindergartens, and hospitals—urging citizens not to use satellite dishes. Those who do not get the message see their dishes destroyed. What explains these totalitarian urges? 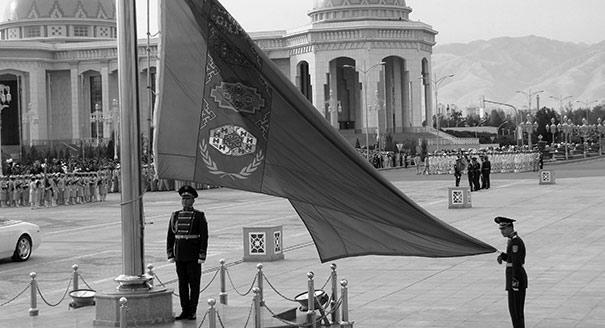 Across Central Asia, personality cults for rulers have stayed unchanged since Soviet times. These cults may differ in form from country to country, but the content remains the same. A hybrid of Stalinism and Eastern feudalism has formed across the region, in which the leader is both “father of the nation” and a “divine gift” to the entire country. Even imams in mosques play a supporting role, preaching the idea that the ruler is a divine gift and that to sow discord against him is a great sin. The Turkmen version of this cult reaches a level of absurdity that puts all other countries in the region to shame. Neither Soviet tradition nor the passion for censorship shared by all authoritarian regimes can explain quite the level of absurdity attained by the videos of the Turkmen president. 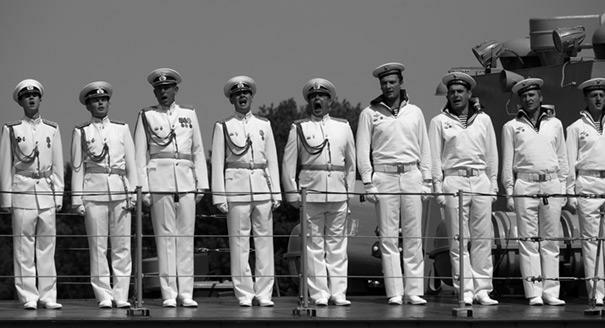 The explanation may come in the personality of the leader himself. The propaganda videos are proof of a deep psychological complex gained during Berdimuhamedov’s many years working under his predecessor, Niyazov, who died in 2006. Under Niyazov, he was an unobtrusive figure who built a career on flattery and sycophancy, blindly worshiping Niyazov as a living deity. Since then, Berdimuhamedov has removed everything that reminds him of his predecessor. The presidential palace is new, the monuments are new, and the cult of personality is also new—even the obedience rituals are new. Instead of kissing the leader’s ring as under Niyazov, Turkmen officials now kneel before Berdimuhamedov when receiving awards. Berdimuhamedov has replaced one cult of blind obedience, in which he was a supplicant, with another, in which he receives all the personal glory.